I was a bit slow to work this out, but having the Learner Profile and Attitudes on my walls had an incredible impact on my teaching. My teacher training, though fairly progressive, did not prepare me for PYP teaching. The culture of classroom management I knew did not apply, and I felt like I’d been thrown in the deep end. But once I got into the habit of referencing these dispositions, my classroom management really turned around. I cannot recommend highly enough that you not only post these things in a very high-trafficked area of your classroom, but also that you come back to them again and again. Every single behavior problem in my classroom could be addressed through the lens of the attitudes. Student giving up on notating her composition? Commitment. Taking over in group work? Cooperation. Not pulling his weight in the ensemble? Independence. Not taking care of the instruments? Respect. Laughing at the opera aria you chose for listening work? Appreciation. And because this is vocabulary that all teachers in the school are using, the students already have an understanding for these terms and—hopefully—respect for aspiring to demonstrate these attitudes. 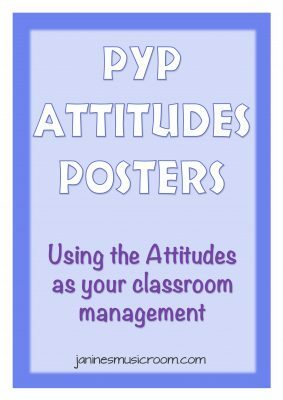 Want to print out a simple display of the attitudes? Download these free A4 posters , and print each one on a different color paper (or whatever colors match your room décor). Side note: I recently stumbled across this great resource listing books that support the Learner Profile and PYP Attitudes. How have you adjusted your thinking about classroom management strategies since becoming a PYP teacher?